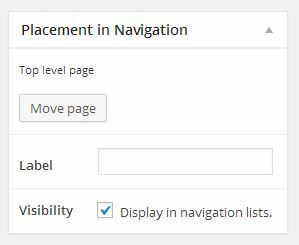 By default, when you create a new page, it will be added at the “top level” (i.e., not underneath one of the schools). 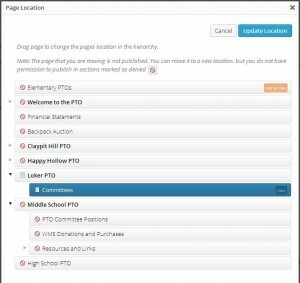 You will want to move each of your pages under your school’s menu. Below you can the dialog you get after hitting Move Page — here I am trying to place a page which I have given the label “Committees” to. It starts out at the top level. Once it’s placed, hit the Update Location button. This will bring you back to your post, which you can then Publish by hitting the Publish button.